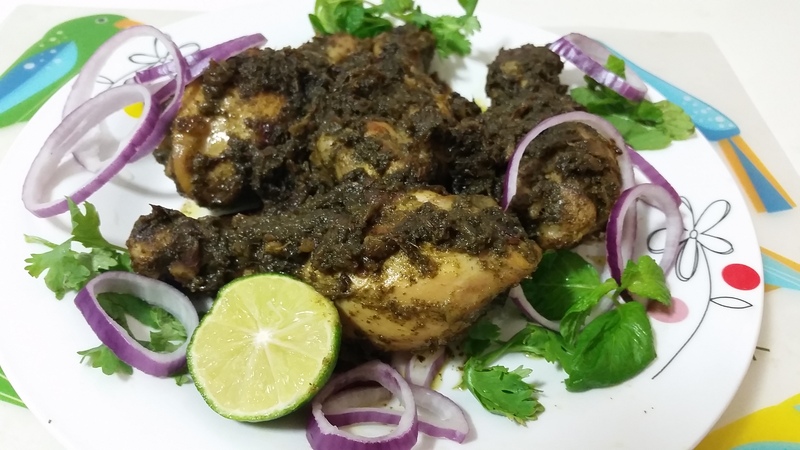 Green Chicken Masala/Hariyali Chicken made with fresh Coriander and Mint Leaves. First Grind Coriander leaves, Mint Leaves, Green Chilies and Curd together to make a paste. Now heat pan. Pour 4-5 tbsp oil. Now add whole Spices. When it starts cracking, add chopped onion. Saute until onion becomes light golden. Now add 3 tbs of Ginger garlic Paste and saute until it’s raw aroma goes off. Now add chicken pieces. Cover and Cook for 2 – 3 minutes. Keep Stirring in between. Now add prepared green paste to it and mix well. Add Coriander and Garam Masala Powder. Again Cover and Cook with Stirring in between, till the chicken is tender and cooked and the gravy has thickened completely as we are preparing Dry Green Chicken. Now add Salt and cook for another 2 minutes. Now Dry green Chicken is ready. Serve with Lemon and Onion. Use Coriander and Mint leaves for garnishing.